Continuation of yesterday’s post. Can’t think of a thing to add just enjoy? One of my favourite sequence or photos provided by Rob White from Australia. I told him I had to have a set of the photos and was so happy when he obliged with an email. 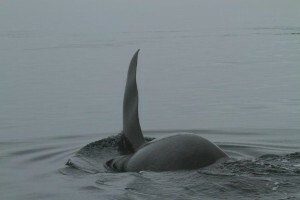 The sequence shows an orca aka “killer whale” passing close to the boat and a guest with a good eye and a fast finger. 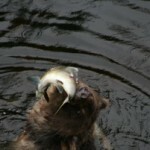 I have never seen another set of photos like this and I have had many guests over the past twelve years. 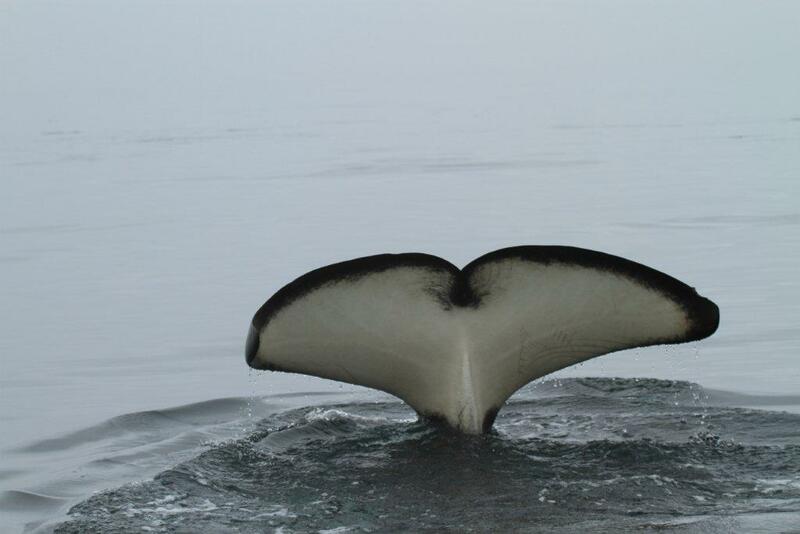 Sitting and waiting is often one of the best strategy during a whale-watching safari. 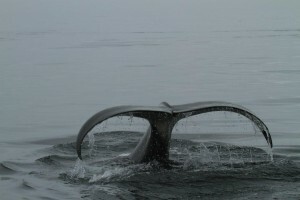 Orcas like their cousin dolphins are curious and will often approach a boat if it is stationary and quite. This orca is on its side looking at the boat as it passes by if it weren’t its dorsal fin would be visible above the surface. 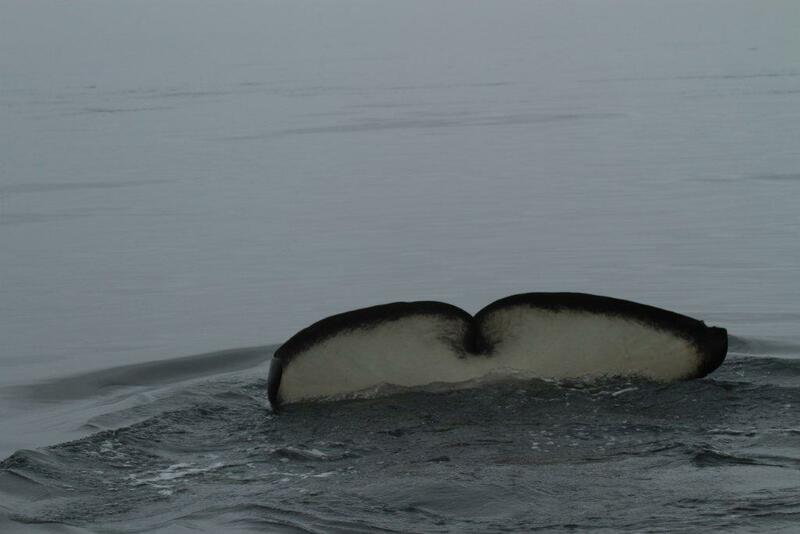 Not an every day occurrence but often enough to get good pictures. 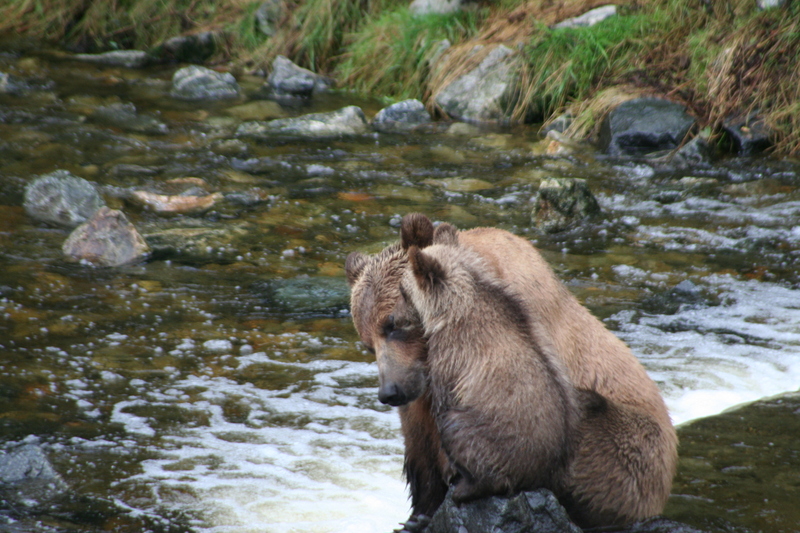 This photo taken in late September shows a seven month old grizzly cub waiting for mother to provide lunch. 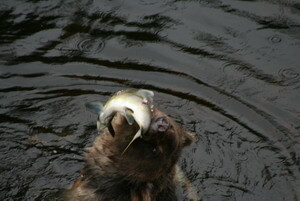 It would be lunch as our time on the viewing stand on the Glendale River is between ten and noon. 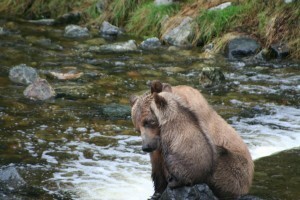 Mother cannot be to far away because at this age the cubs do not leave their mother side for very long. 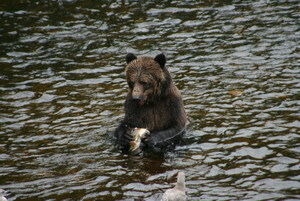 Mother will be close by fishing for the pink salmon that have come into the river to spawn. 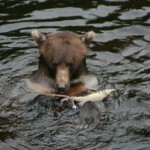 There are several rocks in this part of the river that are favourite perches for the hungry cubs. 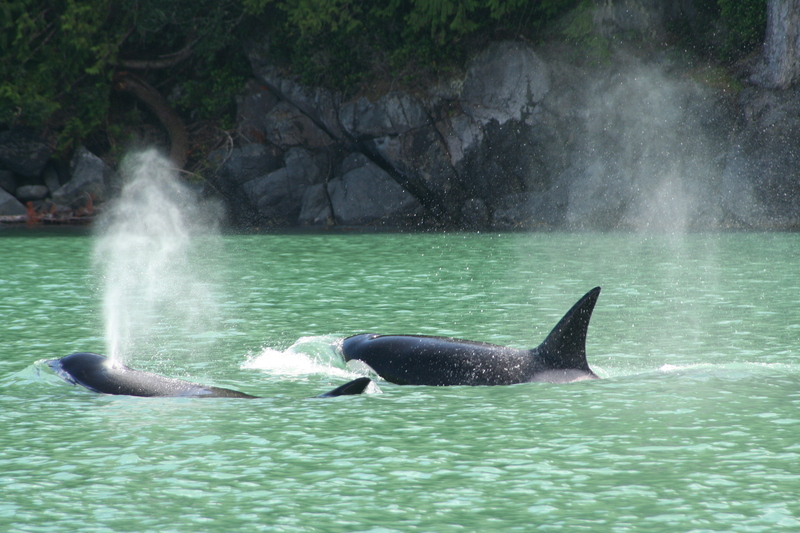 Blackfish, aka Orca, or more commonly, killer whale – a creature that inspires awe in BC boaters. “Blackfish” is what the coastal Kwakwaka’wakw band (First Nation’s peoples) the original inhabitants of the Northern Vancouver Island area in British Columbia called the orca. In fact one area most frequented by the orca is known as Blackfish Sound. 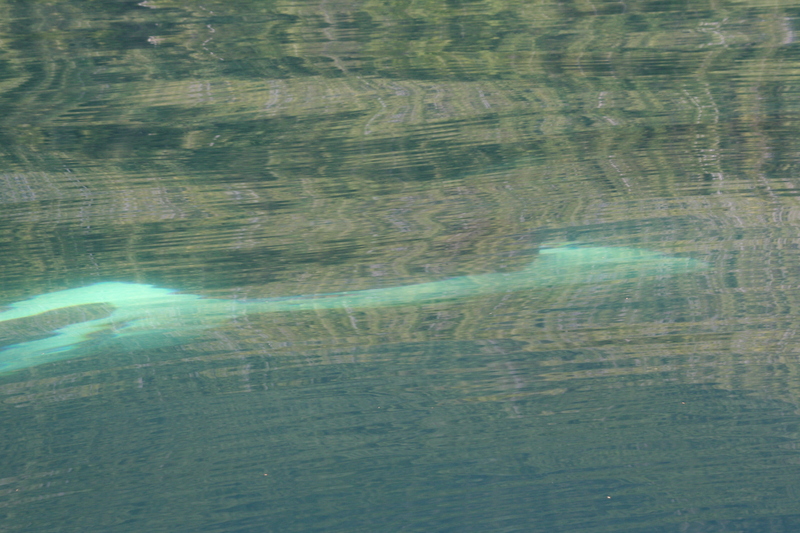 However, this photo was taken in Knight Inlet as indicated by the colour of the water. Knight Inlet is fed by fresh glacial water and this “floats” on the salt water. The rock flour, or glacial flour, consists of fine-grained, silt-sized particles of rock, generated by mechanical grinding of bedrock by glacial erosion. Those rock particles or glacial milk refract the green spectrum of the sun’s light so it appears green. A common saying at the lodge is “black bears are where you find them” meaning that on all tours whether for grizzlies, whales, or the extra day at the river we are always looking for and finding black bears. 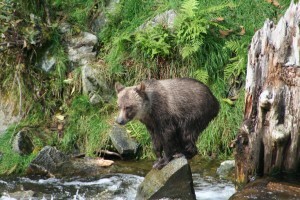 In this case it was a June trip up Knight Inlet for a morning run to the grizzly bears that Glen took this photo of a black bear and her triplets. Twin cubs are common triplets less so but not rare. 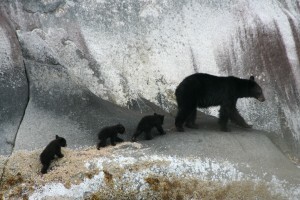 These cubs are likely three to for months old being born in their den February. Many of the black bears is the area have come to accept boat traffic and do not necessarily run for the nearest tree as this mother indicates by her stroll along the rocky shore. 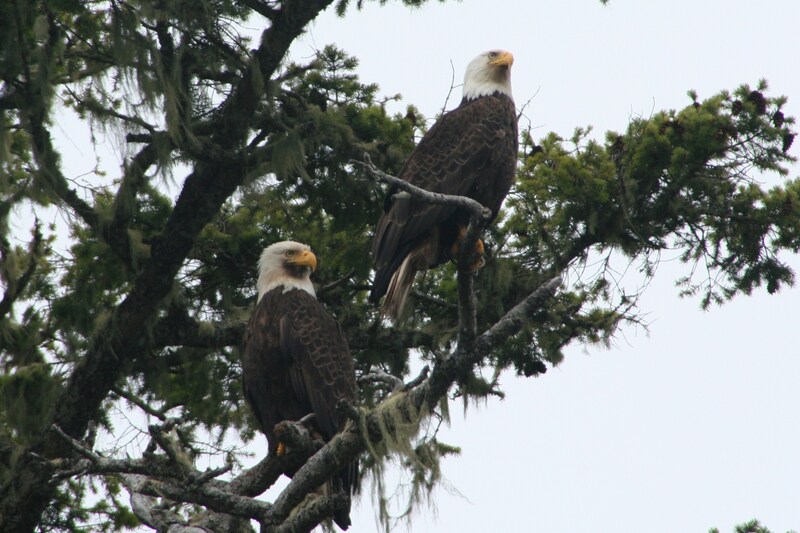 Bald Eagles mate for life, as do most birds. However, if one dies or is lost, the one remaining will take a new mate. Although male and female eagles have the same coloring there is a difference in size. 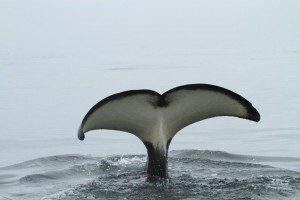 Females are about 1/3 larger than males. Another way to tell them apart is to measure the height of their bill. The female’s bill is always deeper than the male’s and usually has a larger hook than the males. 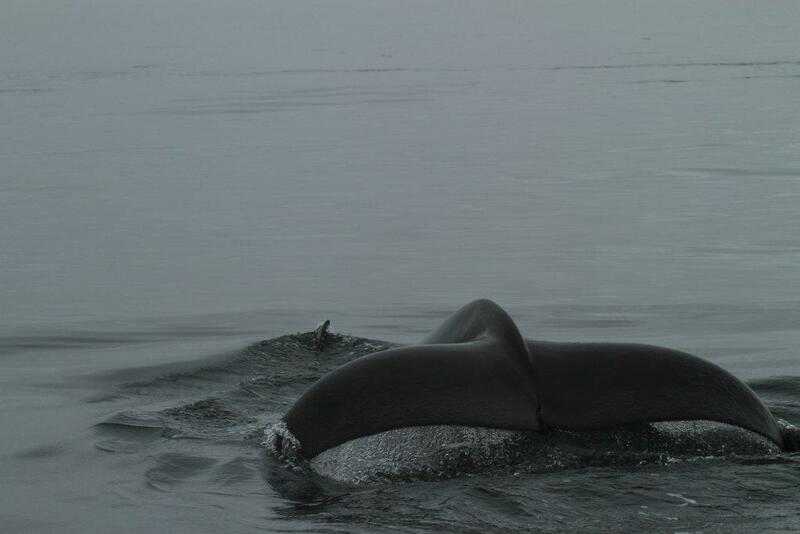 All this being said it is still hard to tell which of these two is the male or female. It is definitely a mating pair because no two eagles would get this close to each other if they were not a mating pair. 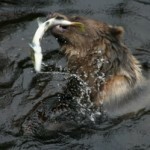 This is the case of a lazy fishing grizzly. 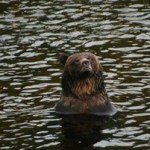 This bear is in a reasonably deep hole compared to the water just 30 meters (90 feet) up stream. 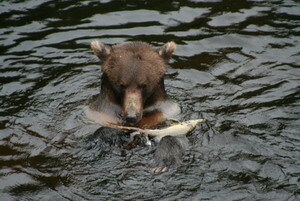 The grizzlies up stream often wound salmon which die and drift down to this lower pool where this bear waits to scoop up the salmon without wasting any energy chasing the salmon. 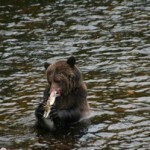 From the first picture is yesterdays post you can see the fish is not moving and it is just a matter of getting the salmon in the right position to eat or it could be considered playing with ones food. 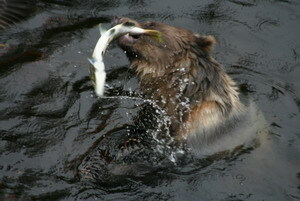 Either way the final photo seems to depict a satisfied grizzly. 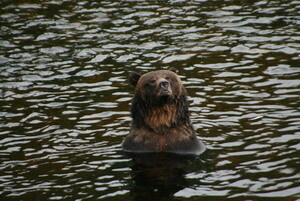 Grizzly Bear Lodge is one of two lodges that have access to viewing stands on Knight Inlet’s Glendale River. Access is granted after August 24th each year. 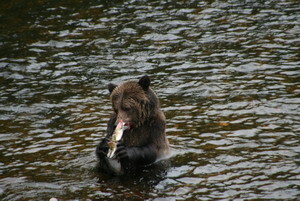 After a boat run up Knight Inlet in the morning you transfer to shore and a fifteen-minute van ride to the viewing stands on Glendale River’s man-made spawning channel. Our access time is from ten to noon each day. There are two stands available of which we prefer the second as it is on both the natural river and the spawning channel entrance. Directly below the stand is a deeper area, which holds the pink salmon before they go over the weir in to the spawning area. This is the site of the above photos. Early morning (6:30 a.m.) from the front yard of the lodge, early depending on which time zone you just arrived from, provides some great photo opportunities. It is not uncommon to hear guest moving about the lodge before we (the guides) rise and shine. This sunrise is reasonably common, as our mornings are frequently overcast. 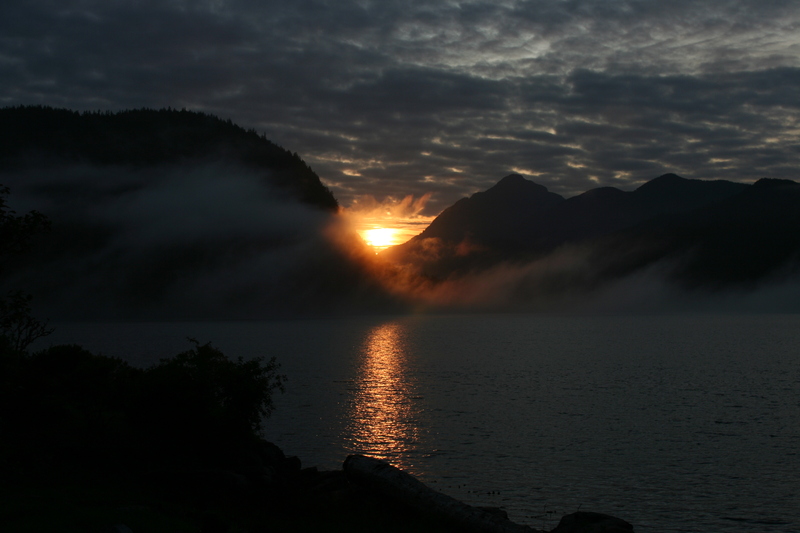 The overcast is due to the wind funnel nature of Knight Inlet, which draws in clouds over night. The good news is that most days they are gone by noon. Just realized that the photo in this post ties back to the post on July 10 with the mother and cub each sitting on their own rock. 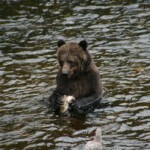 This photo could be indicate the cub was complaining and mother came to check or to console because no salmon have arrive for lunch. This trip has been totally AWESOME and it should be on everyone’s bucket list. Great group and simply fantastic hosts. Plus food was sublime!